So…leftovers, eh? I have the guajillo chili sauce and corn tortillas from here and a crisper full of vegetables taunting me. Time for some improvisation. This turned out amazingly well. It was savory and fresh, full of different textures and an entirely satisfying meal for one. This is as easy as it gets. 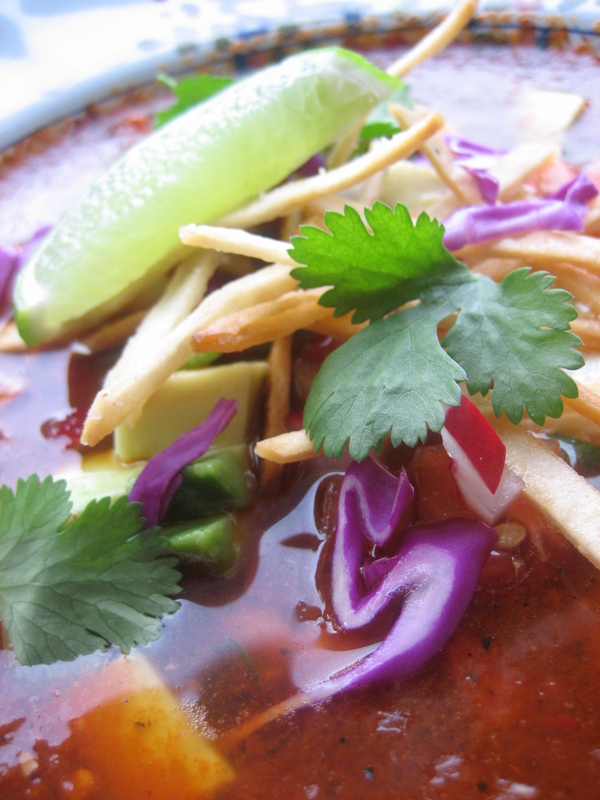 Simply mix the guajillo sauce and vegetable stock together in a pan and heat. When hot, ladel into a bowl and garnish with the remaining ingredients. Mix the sour cream through the soup and squeeze the fresh lime juice over the entire enterprise. Delicious! This would also be wonderful chilled as a gazpacho-style soup.